Tobago is the smaller of the two main islands that make up the Republic of Trinidad and Tobago. It is northeast of Trinidad and southeast of Grenada. The capital is Scarborough, which is located on the island’s southeast coast. The island has had an exciting history, having been fought over by numerous nations since 1498 when it was sighted by Columbus. Initially the Carib population defended itself against other Amerindian tribes. Then came the European colonists from the late 1500s to the early 1600s. First came the Courlanders in 1654, followed by the Dutch, English, Spanish, Swedish, and French. The island was a battle zone as it changed hands 33 times during this period, the most in Caribbean history. 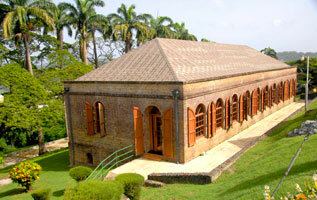 Tobago was finally ceded to the British in 1814 under the Treaty of Paris. Because of this history, the island has many interesting historic sites including forts (Fort Milford, Fort Bennett, Fort King George and Fort Grandy) as well as the Speyside Lookout, the Mt. Dillon Lookout, the Cambleton Battery, and the Mystery Tombstone. They provide visual evidence of the conflicts that brought different nationalities and cultures to the island during this period. Today Tobago is an island rich in culture and natural beauty. Many of the folktales, superstitions, art, music and traditional dances reflect the island’s European and African roots. These are celebrated annually during the Tobago Heritage Festival held from early July to August. The island hosts the hemisphere’s oldest natural rain forest preserve. The Tobago Forest Reserve has great biodiversity, including 220 species of birds, 133 types of butterflies, 14 species of frogs, and 5 species of turtles including the endangered giant leatherback. 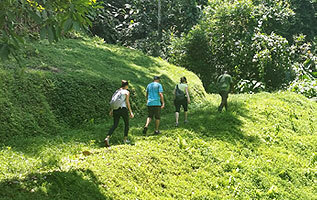 It is one of the most approachable rainforests because it is relatively small. 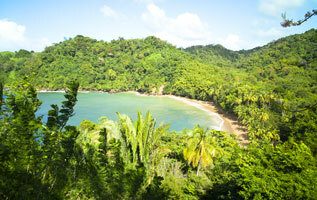 In all Tobago is home to over 6,000 species of plants and animals on just 116 square miles of land. The entire island enjoys lush vegetation and cascading waterfalls, and is exciting to explore for those who enjoy ecotourism. Tobago also has many idyllic beaches along its coastline, especially those at Castara, Bloody Bay, and Englishman’s Bay. Tobago is a popular diving location because it is the southernmost of the Caribbean islands that have coral communities. Its crystal blue waters and miles of reefs make the snorkeling and diving experience a true treasure. Its variety of exciting dive sites has made it one of the top dive destinations. Many consider it the world’s best drift-diving destination. A recent addition to Tobago’s event calendar is the Tobago Fest, a Carnival-style celebration featuring many elements of the world famous Trinidad and Tobago Carnival. Golfers will enjoy Tobago’s two beautiful courses, one of which is on the property of the Magdalena Grand Beach & Golf Resort. The other is nearby, and both provide panoramic views while challenging golfers of all skill levels. Finally, the Village of Buccoo is the goat and crab racing capital of the world. Crowds are drawn there during the Easter Holidays to view specially trained goats sprinting towards the finish line with jockeys in hot pursuit and to watch while crab jockeys prod their crustaceans towards the finish line. Both are exciting and unique experiences for locals and visitors alike. All of these Tobago activities can be arranged at Magdalena Grand Beach & Golf Resort upon arrival and all recommended excursions are given by certified guides or local tour operators.